Universe Boss - that is how Chris Gayle introduces himself and has got well-known among the cricketing circles and the fans of the sport all across the world. The hard-hitting West Indian batsman is hailed as arguably the most dangerous batsman in T20 cricket courtesy his breathtaking exploits with the willow for the Maroon Brigade and multiple franchises all around the world. There is no cricket stadium in international or club cricket where the brutal onslaught of the 'Gayle storm' hasn’t struck, leaving bowling attacks demoralized and fans awestruck. Once the Jamaican belligerent stroke-maker gets into his hitting zone, no ground is big enough to contain those sky-rocketing towering sixes. Over 12,000 T20 runs, studded with 21 tons, makes the Jamaican juggernaut the undisputed batting king of T20 cricket. Amid all the spotlight Gayle garners in T20 cricket, his rather stellar record in ODI cricket for the Windies often get undermined or overshadowed. 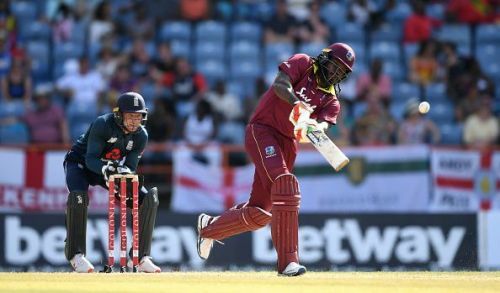 While there is not an iota of doubt that Gayle has been among the greatest batsman in the shortest format, he has done more than enough to lay his claim as one of West Indies' all-time ODI batting great. The Windies boasts of a rich legacy of producing some of the finest ODI batsmen in Sir Vivian Richards, Gordan Greenidge, Desmond Haynes, Brian Lara, Carl Hooper and Shivnarine Chanderpaul to name a few. After their last well-knit group of batting greats of the 90s in Richardson, Lara, Hooper, Chanderpaul and Adams bid adieu to the international scene, a new crop of players emerged at the turn of the new millennium. Among them, Chris Gayle, Ramnaresh Sarwan, Ricardo Powell and Wavell Hinds were considered the most promising to take the baton of Windies batting forward. While some of these batting stalwarts served West Indies cricket with great distinction, Gayle emerged as the ultimate racehorse surviving the grind of international cricket for almost two decades. Chris Gayle has been West Indies most successful opener in their ODI history by a mile. He has scored the most runs while opening the innings for the Calypso Kings in white-ball cricket. Now that by any means is a tribute to the Jamaican swashbuckler considering the fact West Indies had some great openers - Gordon Greenidge and Desmond Haynes. West Indies had their share of troubles in finding a suitable opening combination for a long time. Over the years, Phil Simmons, Philo Wallace, Sherwin Campbell, Stuart Williams, Wavell Hinds and Lendl Simmons all prospered for some time but did not last long enough. Amid all this chipping and chopping, one end of their opening anchor was always held tight by Chris Gayle. At last, there seems to be some semblance in the Windies top order with diminutive yet flashy strokemaker Ewin Lewis who has played some whirlwind knocks up the order to show that he belongs to the highest level. Much to his credit, Gayle is West Indies second highest run scorer in ODI cricket, only behind their mercurial batting genius Brian Lara. He is also the second West Indian batsman to scale the herculean 10000 run mark in limited overs cricket. With 25 ODI hundreds under his belt, Gayle has more tons than any other West Indies player in the limited overs format, again proving that fact that he has been an outright match winner in white ball cricket. To add to the list of Gayle’s superlative achievements, no Windies other than him has ever scored an ODI double ton and that too in the ICC Cricket World Cup. Gayle's six-hitting prowess has made him his country’s highest six-hitter and placed him only second in the all-time list behind Pakistan’s destructive power hitter Shahid Afridi. He also holds the distinction of becoming the first West Indian to club 300 ODI sixes. The Southpaw many not be the most elegant looking opener but when it comes to unleashing carnage on bowlers, there aren’t too many better than Gayle. Windies who have languished from the very top of World cricket to the bottom are seeing somewhat of a resurgence in ODI cricket. With the 2019 ICC World Cup just around the corner, Gayle hitting top gear and getting back to his lethal best surely comes as a big boost to the Windies. The Maroon Brigade shall require their proven workhorse to lead a group of young yet talented batsmen in Ewin Lewis, Shai Hope, Shimron Hetmyer and Nicolas Pooran in the upcoming showpiece event in England.